Mondays, July 25– August 29, 2016 6:30–8:30 p.m.
Beloved fictionalizes the true story of Margaret Garner, a fugitive, American bondwoman who committed infanticide rather than permit her children’s re-enslavement. Morrison’s version poignantly imagines relationships rent apart or forged by the denial of their participants’ humanity, and explores what it means to be unfree in a country ostensibly built on freedom. 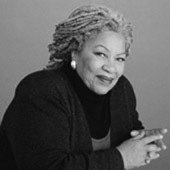 Our seminar will consider Beloved’s place in the American literary cannon––what it challenges, builds on, and establishes––and how to read the novel nearly 30 years after its initial publication in light of current conversations about race, citizenship, and gender. Alongside Beloved, we will examine recent works by African American artists that confront and attempt to heal personal and national trauma through imaginative mediums. Guide: Béalleka is a Kenyan-born, Portland-based writer, storyteller and “recovering academic.” For a decade (as Lynn Makau) she taught African American literature and gender and women’s studies at Colgate University, Michigan State University, and Willamette University. Her scholarly work focuses on intersectional politics and contemporary representations of American slavery in fiction, film and visual media. She is the recipient of two MacArthur Teaching and Research Fellowships, and a publication grant from the American Association of University Women. Her essay on breastfeeding in Beloved as a fugitive act appears in the anthology Victim No More: Women’s Resistance to Law, Culture and Power (2009). The journal Psychoanalysis, Culture & Society (2014) published her account of teaching affective readings of the film Django Unchained. She is currently writing a memoir that explores her healing path, and establishing a business offering cross-cultural competency and life coaching.